Not fighting the vitamin and supplement addiction anymore. I find that previously, I’ve fallen into traps where I’ll fall prey to quick fix diets, trains of thinking, and false idols to follow. My threshold for following these quick fix “whims” use to be much larger. Like when I was 18 at Salem State College and my roommate John was a vegan. I’d go to dinner with him each night and maybe it was to fit in or I was just a very impressionable person at the time, but I took on the lifestyle. Still eating dairy, but I was strictly non-meat for 8 months. Now at 30, I get urges to stop eating meat, carbs, sugars, caffeine, or anything else and it lasts no more than a full day. This could be from a huffingtonpost article or a conversation I hear on any number of podcasts. It’s like my body has made up its own mind as to its addictions/likes or what it feels like it must have and any kind of new outside condition I force upon on it, will be rhetorically scoffed at and I’ll binge eat the thing I’m trying to avoid the following day. I think when you’re 18, your mind/body is much more flexible with what it can endure and accept for longer periods of times. 18-25 truly is your experimental phase as a human. After 25, maybe metabolically, it’s harder to stray from the meat/potatoes/bread/beer program that is so comforting to your stomach and mind. Matters of health and diet have always fascinated me. I’ve spent several hundred dollars on supplements over the years. These are a few just from memory: Omega 3 from fish, hemp, krill, and flax seed. 3 blend mushroom. St. John’s Wort. 5-htp. melatonin. sam-E. coQ10. coconut oil. green coffee bean extract. acai berry. alpha brain by onnit. I’ve experimented with many things to get some upper edge mentally or just to have more physical energy. Or if I went through bouts of depression, I would scour supplement sites for just the thing that would pull me out of the funk I was in. Not realizing or being wise enough to know, that down moods are necessary for up moods, the rubber band kind of needs to stretch both ways in order for emotions to exist. Trader Joe’s Super Green Powder: The Elixir of Life? First and foremost, I’m kind of a health junkie, or I try to be in a very strange way. I do however still smoke a cigarette or two on a daily basis, so that’s part of the great balancing act, almost staying neutral with whatever good foods I do eat? It’s a battle and I almost feel lucky to be off the hook with only 1 or 2 a day. My favorite grocery store is Trader Joe’s for its amazing variety, prices, and overall quality of food. Plus the employees are very genuine and not zombified in any way, actual conversation will often occur; I know it’s amazing! I think America tends to be overly obsessed with quantity over quality and this shows in our protruding guts, as we steadily become the fattest nation in all of mankind’s history. Fast food dollar menus, the cheap meat selection at Walmart, ultra fortified white bread by way of the never ending bread stick supply at Olive Garden, and many more examples that you could think of on your own in less than two minutes. Cheap carbohydrates, cheap sugars, excessive fats, and all the rest. I’ve also become increasingly more paranoid around the subject of the pesticides that are regularly sprayed on most fruits and vegetables – so I do try to buy all organic when it comes to fruits and vegetables. Also there’s fluoride to consider with drinking water – but hey there’s also the plastic with water bottles that can leech out if the temperature is too warm, so I understand mankind’s limitations in 2011. I’m still learning a lot about what the best diet is for me and according to the BMI index I still need to lose a good 15-20 pounds, so I do have a long road ahead in that regard. I definitely don’t have the strictest diet and actually use the microwave on average about 2-3 times a day at work, which I’m sure cancels out a lot of the nutrients I actually try to take in. 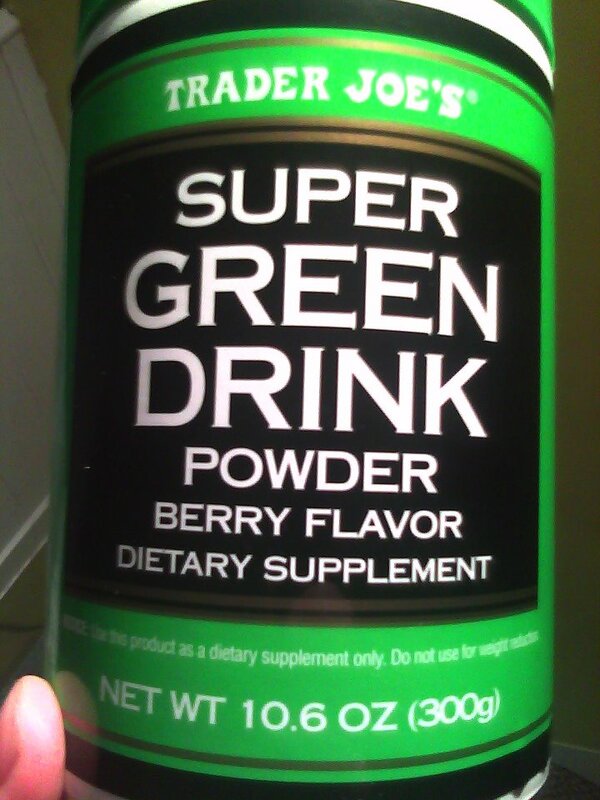 I recently picked up Trader Joe’s Super Green Powder supplement for $19.99. Sure, kind of steep on the surface, but when I read the ingredients on the back, I had to give it a try. I’m mostly posting the ingredients below, because I’ve not been able to find them on Trader Joe’s website or anywhere else on the web. -concord grape, acerola cherry, milk thistle, red beet root, aloe vera leaf, pomegranate, turmeric rhizome extract, atlantic kelp, green tea extract decaf, quercertin, non-alcoholic red wine extract, grape seed extract, blueberry leaf extract, licorice, vegetable extract, fruit extract, cinammon and strawberry powder. I’ve tried the multi-vitamin route before, but it just never seemed to add anything to my energy levels or help me concentrate/focus better. They would almost make me more prone to zone out and become kind of apathetic, in a weird way. So i’ve only been taking this a few days, but already I feel a real energy uptick, and I’m not as lethargic when I get home from work. I’ll try to check back in about a week. But investigate those ingredients for yourself. I know I don’t get near the amount that is recommended on a daily basis, so this seems to be a good overall approach. Hoarding supplements before the Government steps in? Lately the funk has been set in to place. Buying supplements again, as some sort of mysterious placebo/panacea cure I seek. Something under 10 bucks and that can be bought without a prescription, I’m a sucker every time. A sucker for Acai berry this time, Mind medicine by Pomology, and of course Vitamin D as I might get 15 minutes of sun a day driving into working at 6. I actually have a kind of high right now. 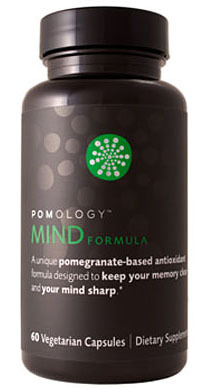 I combined the Acai berry, Pomology Mind (b12, dha, folate, acetyl-carnitine, gingko biloba, choline, pomegranate, ashwaganda), and Vitamin D.
It’s almost like I can feel the blood in my brain whizzing around and there’s these small waves breaking, kind of giving my whole head/mind? This warm, tingling sensation – similar to smoking weed, but not as severe. Maybe without the paranoia and anxiety. Brain medicine, Anti-aging medicine, and D for not getting enough sun. I’m pretty sure supplements will evolve to a point where you take only 1 at any given age. Your blood type, DNA, other genetics, will be calculated and assessed when you’re born and a printout will suggest what you might take each year up until let’s say 80. I’ve always been fascinated with supplements and the always pressing question of how much of a placebo they really are or aren’t. 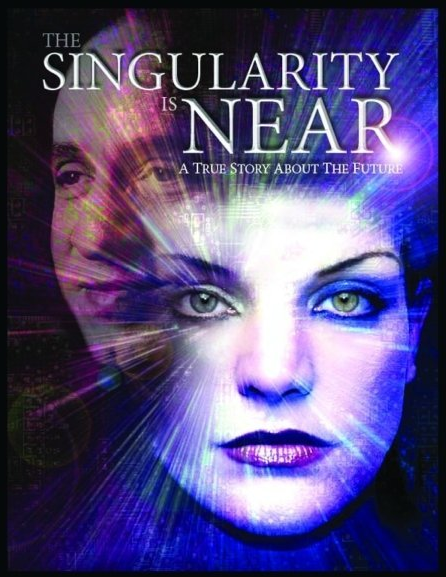 Not being a scientist, with test subjects at my beck and call, I can only read random articles that confirm that they do in fact do “something.” Of course I’m not going to gravitate towards the sites that just label most supplements placebo’s, that suckers buy to try and get some perceived upper hand. But it’s all really done as a kind of preventative maintenance, a way to give yourself a chance, especially if the government decides to outlaw all health supplements. 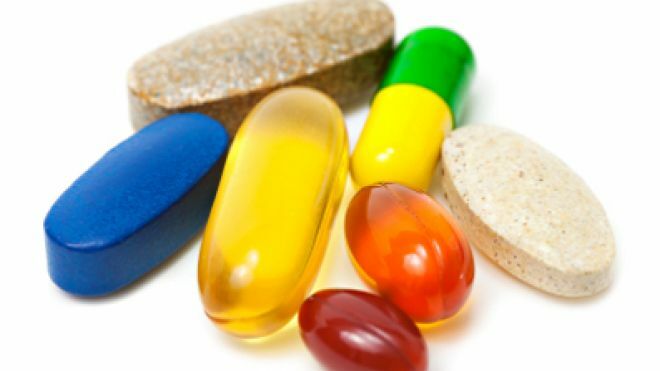 Now why would the government want to regulate the supplements you take? Their main argument is rooted in Nanny state rhetoric, as the general public will not do enough of its own research into what they’re putting in their bodies. But this is such an irrelevant argument, as most everybody alive today has the most amount of access to the most exact kind of information, than ever before. As big Pharma grows and soon takes over Oil as the next booming industry (baby boomers!) you just have to follow the money. Maybe we shouldn’t hoard canned foods, but legit, useful supplements – while they’re still being produced by the private sector. This is similar to my view on marijuana. 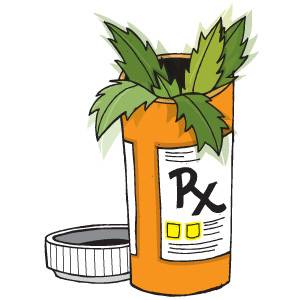 I can almost imagine that if pot did become legal, you’d only be able to possess government grown weed, and there would be severe fines for homegrown bud or the variety you already enjoy now. So they would be making billions off of taxes and then the fines and prison sentences for possessing “unregulated” marijuana – a win, win. Plus all of the small growers that would be put out of business if it was legal across the board. It’s hard to say now if this kind of trade-off would be worth it in the long run. Less people drink, smoke more/culture-society loosens up, become less concerned with rah-rah “we’re number 1” rhetoric, defense budget lessens…We can just wait on the fine print “if” it ever does become law.